Efforts to establish reformatory institutions for the young in Glasgow date from 1801 when a Professor of Divinity named Stevenson MacGill founded the Glasgow Society for the Encouragement of Penitents. The Society aimed to rescue and reform juvenile offenders by creating two charitable institutions: a 'halfway house' for boys convicted of vagrancy, and a home for young prostitutes, or 'magdalenes'. Eventually, in 1816, their efforts resulted in the opening of the Magdalene Asylum in premises at 286 Parliamentary Road in 1816. Funding for the establishment was raised from private contributions. It took until 1838 for a boys' reformatory, known as the House of Refuge, to be established. After the institution quickly proved successful in reducing crime in the city, there was pressure for a similar establishment to be opened for girls. When the Lord Provost of Glasgow requested that the Magdalene Asylum be adopted for the purpose, its directors agreed on condition that part of the premises be reserved for 40 magdalene cases below the age of 25. The rest of the establishment was then used to accommodate up to 120 convicted girls who agreed to be confined there after spending an initial two weeks in prison. The new institution, known as the House of Refuge for Females, began operation on 12 October 1840. In 1841, the funding of the two Houses of Refuge through the local rates was made possible through the parliamentary Act for Repressing Juvenile Delinquency in the City of Glasgow. Despite this assistance, both of the Refuges continued to require charitable donations to meet their running costs. On 14 November 1854, the reformatory section of the Female Refuge was certified to operate as a Reformatory under the 1854 Reformatory Act, the first national legislation relating to the setting up Reformatories. The premises were licensed to accommodate up to 180 girls. The Parliamentary Road site is shown on the 1856 map below. Glasgow House of Refuge for Females site, Glasgow, c.1856. An inspection in 1856 noted that the Reformatory section was divided into three wards: the first, of probation; the second, for average conduct; the third, for merit. The girls were employed in laundry and needlework, the younger ones in making paper bags. The Females' House of Refuge constitutes a portion of what was once known as the Magdalene Asylum, established by private contributions in 1816. The Institution is now supported by a general tax on the community of one penny per pound venial — of the proceeds of which tax we believe two-thirds are appropriated to the House of Refuge for Boys, at Annefield Place, and one-third to that of this Institution. Voluntary contributions are also received, and we think it is impossible to draw the public attention to a more deserving object. It forms exactly a house of refuge from crime, which individuals of two different classes are plucked as brands from the burning, and kindly subjected to reformative discipline, without restraint or coercion in any form whatever. When we visited the Females' House of Refuge the other day, we found that the building was undergoing extensive repairs and improvements. An additional wing has been added, so as to provide accommodation for 240 inmates. At present the number of inmates is 140. Of these about 60 belong to the Magdalene Asylum, which may regarded as a perfectly distinct institution from the Refuge for young people. Both are under one, management, and occupy the same buildings, adjacent the Town's Hospital. Internally, however, the arrangements are so made that the Magdalenes, or reclaimed young women, never come into contact with the little girls who occupy the wings of the building. The latter at present in the Refuge number about 70, averaging from 8 to 13 years of age. They are divided into four wards or classes, under the surveillance of four female superintendents, each of whom has a separate room, annexed to which is a sleeping apartment for the children of that ward. Wards first and second are the receiving wards. The children enter these immediately on being received into the institution. The inmates of each of the two are treated exactly in the same manner, and occupy the same level. They are divided, however, into two classes or wards to admit of the separation the criminals from those who were merely destitute, or otherwise admitted into the institution. The first which we entered was the ward for the little delinquents. The word "criminal," however, is never mentioned here. The little girls themselves are not informed of the nature of the classification. Those in the delinquent ward are as tidy, and quiet, and pleasant-looking, as the others. The poor things have been snatched from crime before they knew the nature of it; and after, perhaps, a first and small offence. They soon become amenable to discipline, and everyway as promising the others; and when they are promoted, at length, to the merit wards, all distinctions disappear, and they mingle indiscriminately together. "And here it may be right say a few words about the merit ward, begun two years ago, the privileges of which are greatly valued. To influence children, the motives must be suited to their years, and this has been studied in a variety of little ways. First of all, the appearance of the ward has been improved, and its greater neatness speaks at once to the eye. Its maps and pictures are attractive, and afford lessons no less entertaining than instructive. Then there are copy-books and slates, for writing and counting — an occasional walk into the country, and sometimes a sail in a steam-boat. More than all, there are little frocks and bonnets for the Sabbath, with permission to attend church; and in token that they can now be trusted, they are sent with messages over the city. The merit ward is thus a great step, and the hope of reaching it operates with excellent effect. When attained, there is good hope of the child, and the position is very rarely lost, but great pains and patience are needed to get them this length. Fairly afloat, it is pleasing to mark their progress, and often not less surprising than agreeable. The ward now consists of thirty-one children, many of whom had hardly an idea of right and wrong beyond that of danger and punishment. Stealing they knew was hazardous, and shunned, but of its moral evil there was but the feeblest perception, and some cases, perhaps, no perception at all. Happily it is now otherwise. There is a great degree of conscientiousness, and increasing moral sensibility. Only a single falsehood has come to light during the last four months; and the superintendence is so minute that hardly anything can escape notice. It may be remarked, that some the best of these children were once in crime. Results so pleasing afford the best proof of the zeal and fidelity of the Superintendent, whose endeavours to enlighten and educate the conscience have been unwearied." The method appears to be completely successful; and therefore the system is extended so far that, by conduct and higher attainment, those who have reached the third ward are finally promoted to the fourth or highest, in which their little privileges are still farther extended. This is the utmost acme of their ambition. It is, indeed, a very high eminence, and not easy of attainment. Cheerful obedience to all the rules for many months together, and a certain facility at writing small hand, and making a shirt from beginning to end without assistance, are necessary qualifications for this supreme dignity. Only six are at present in this ward. A considerable number, however, were lately draughted off, and their places will soon be replenished by new promotions from below. Those who have reached the highest ward can rise no farther in the Institution. They are now candidates for service in any families that may employ them. Generally speaking, they have seldom to wait long, because when they have reached this point, the mere fact of their high elevation is proof that they can be thoroughly recommended. Any one who reads the rules of the Institution, and who knows and sees how strictly they are enforced and administered, will readily admit that no little self-command is necessary to climb up here. Indeed, by a false step — a little loss of temper or untruthfulness — they are at any time liable to sent back to the very foot of the ladder, at which they must begin again to climb up by degrees. One of the most highly important facts connected with the Females' House of Refuge has yet to be mentioned. Not a Magdalene or little girl — even although a delinquent from prison — is retained in it against her will. There is no compulsion on any one to remain. No restraint but that of love and kindness and moral persuasion is exerted. The inmates of the Institution are all taught to consider it as a privilege that they are permitted to reside within its walls. This system, it must be confessed, is new. For some years a system of restraint was tried, but it was found not to succeed. The house was looked upon as a prison, which, in a certain sense, it really was. The spirit thus generated was found to be the very reverse of that which the Directors of the Institution wished to produce. The new system appears to work admirably; and so far as the House from being now considered a prison that a small board is paid for some of the children, although the majority are orphans or otherwise destitute and deserted. It is, indeed, pleasure to visit the Institution. Everything has the air of neatness, comfort, cheerfulness, and cleanliness. One of the apartments is devoted to the purposes of a schoolroom to which the inmates of the different wards proceed at different hours. This apartment is also furnished as a chapel in which divine service is performed every Sunday, and suitable addresses and admonitions delivered to the young inmates. The sleeping apartments, of which there is one for each ward, are clean, spacious, airy, and neat. The food allowed to the children is plain, wholesome, and abundant; and all the interior arrangements of the Institution appear to be well calculated to promote the moral and physical well-being of the inmates. In 1865, the Glasgow City Parochial Board announced that it intended to make a compulsory purchase of the House of Refuge site for use as an extension to the adjacent City Poorhouse, or Town's Hospital. The House of Refuge then moved out to a new site at Maryhill, together with the city's Magdalene Institution, a charity with whom it had already begun to share the Magdalen department of its Parliamentary Road building. Each organization erected its own new building at Maryhill — a Reformatory for the House of Refuge and a penitents' home for the Magdalene Institution. The House of Refuge's new premises, designed by Glasgow architect John Honeyman, were formally certified to begin operation on 19 May 1868. Miss Mary Sliman, who had assisted her sister in the superintendence of the old institution, had sole charge on the new establishment, with three assistants. The Maryhill site is shown on the 1910 map below, by which date the House of Refuge's premises had been taken over by the Glasgow Girls' Industrial School. Glasgow House of Refuge for Girls site, Glasgow, c.1910. In 1879, it was decided that the Reformatory girls at Maryhill needed to be placed on their own separate site. While a long-term home was being found for them, they were transferred to temporary premises at Reddrie (or Riddrie) Farm, on Cumbernauld Road, Glasgow. The site, which had previously provided accommodation for Glasgow's Boys' House of Refuge and the Boys' Industrial School, was formally certified for use on 16 May 1879. During its occupancy of 'Reddrie Farm', the institution was superintended by Miss Jane Rankine. 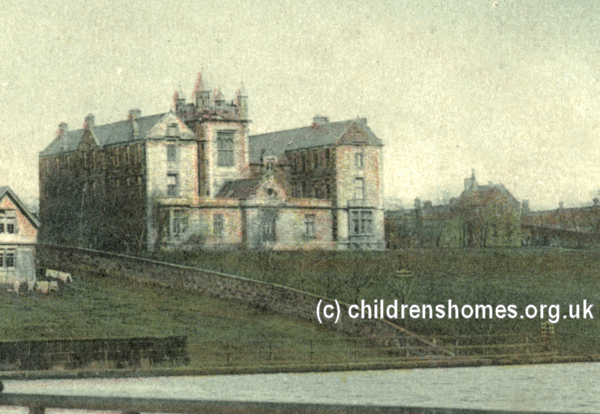 In 1882, the House of Refuge transferred to new purpose-built premises at East Chapelton, Bearsden, East Dunbartonshire. The site was formally certified for operation on 1 July 1882, with accommodation for up to 60 girls, aged from 9 to 14 years. The staff now comprised: superintendent, Miss Mary S Sliman; teacher, Miss Mary Mackenzie; sewing mistress, Miss Julia Mackenzie; laundress, Mrs Fulton; janitor and gardener, Mr R. Fulton. From this date, the establishment was increasingly referred to as the Glasgow Girls' Reformatory School or the Chapelton Reformatory. The Chapelton site is shown on the 1896 map below. Glasgow House of Refuge for Girls site, Glasgow, c.1896. An inspection in 1888 noted that the School buildings were very well arranged, in fact 'none better'. There was a good playground and a very good garden. Schoolroom work was rated as 'very creditable'. Laundry work was the principal industrial training for many of the girls, with a good deal of work being undertaken for households in the neighbourhood. Kitchen and housework occupied those not engaged in washing, and sewing and knitting were also taught. Two small fields were attached to the school and a cow was kept. In the previous year, three girls had been sent to Canada in the charge of Mrs Cameron, superintendent of the Maryhill Industrial School. Miss Sliman was succeeded as superintendent in 1888 by Miss Julia Mackenzie, formerly her assistant. The following 1889, Miss Mackenzie was replaced by Miss Brown, previously the schoolmistress. Miss Brown was followed in 1893 by Miss Hunter. The 1896 inspection recorded 43 girls in the School, with 7 out on licence. It was noted that a new sickroom had been constructed. In the classroom, the subjects taught included singing, grammar, recitation, mental arithmetic, geography, history, object lessons and elementary science. A number of the girls could name every bone in the skeleton. Twenty-three of the girls had lessons in cookery twice a week. Physical drill was given regularly, and special efforts were made to improving the bearing and gait as well as well the physique of the girls. In the summer the girls were taken out in the countryside around for picnics, and in the spring a number of them had a few days' change on the Clyde. Nearly every girl went out in her turn, unaccompanied by an officer. on messages or in connection with the laundry. Girls were taken by the superintendent herself from time to time into Glasgow for shopping or to visit their friends. Miss Hunter left in October 1904 and was succeeded by Miss W. McMillan. She resigned in April 1908 and was replaced by Miss M.R. Stevenson. A mark system was now in operation, providing rewards for god conduct and classroom performance. Each girls made her own clothing. A drill master visited weekly and Swedish exercises were taught. Concerts and other entertainments were organized throughout the year. A fortnight's summer holiday was taken at Ascog. After a period of declining admissions, the School was closed in 1926. The site later became the Hillfoot Holiday School and the Hillfoot Residential School. The buildings no longer survive and a shopping centre now stands on site.